Purging data permanently removes information from the repository. Events derived from that data are purged with the data. The purge functionality purges closed events and related data, only. The purge process is started approximately once every day, or when the MySQL Enterprise Monitor User Interface is restarted. If you change the purge duration from a large timespan to a smaller one, the data is purged in increments of one hour, from oldest to newest, until the new data retention policy is met. This is done to reduce the load on the repository. 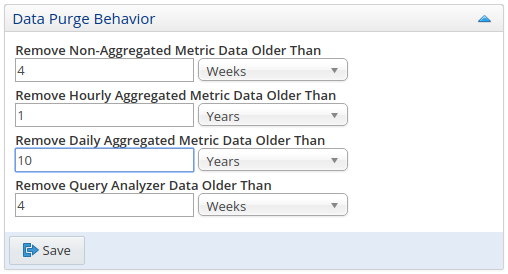 Remove Non-Aggregated Metric Data Older Than: configures the duration that the non-aggregated data collected from your monitored assets is retained. This includes all data collections, including CPU, memory and connections and activity statistics. Remove Hourly Aggregated Metric Data Older Than: configures the duration that the hourly aggregated data collected from your monitored assets is retained. This includes all data collections, including CPU, memory and connections and activity statistics. Remove Daily Aggregated Metric Data Older Than: configures the duration that the daily aggregated data collected from your monitored assets is retained. This includes all data collections, including CPU, memory and connections and activity statistics. Remove Query Analyzer Data Older Than: configures the duration that the query analyzer statistics and information about individual queries is retained. Purging can be carried out manually by enabling innodb_file_per_table for the repository database and using an OPTIMIZE TABLE operation to reclaim space from deleted rows in the table. If you change the purge value from a high value to a very low value, the space used by the purged data is not reclaimed from the InnoDB tablespaces. Do this by running OPTIMIZE TABLE on the MySQL tables for MySQL Enterprise Service Manager to reclaim the space from the purged rows.